Introduction to Precious Metal Clay. 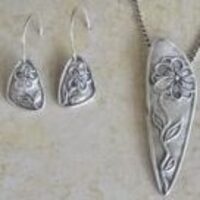 Learn how to make beautiful fine silver jewelry using Precious Metal Clay. In this one day workshop, students will create their own unique patterns to use in texturing their metal clay design. Using sheets of scratch foam and ball stylus tools, they will sketch/draw deep impressions in the foam, which will be used to create a wonderful relief in the metal clay. Students may create a pendant, and/or earrings. Other texturing methods will be reviewed and discussed. All pieces will be completed in class including firing, burnishing, adding patina, and polishing. Students will leave with a finished piece they can be proud to wear! Beginners are welcome! Limit 8 people (ages 18+) Students should bring a brown bag lunch, wear closed toe shoes please. Please pre-register for this class on our website.